Cake is to me what water is to fish !! u feel it too ? 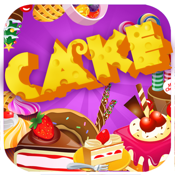 Come and join us to be immersed in this cool and fun app, enjoy creating different amazing cake designs. To begin with, select a plate or cake u like. Then, pile up little things on one another. Flowers, piping, fondants, toppers, candles, and so forth. Make a fabulous assortment of them. Now, game on !! u wanna be a great pastry chef ? Then start to create ur own stunning cake through the huge selection of ingredients ! !